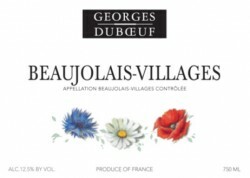 Georges Duboeuf Beaujolais Village & Crus Du Beaujolais 2009 Tasting With Franck Duboeuf. Fresh, juicy-ripe red cherry and raspberry notes, very floral with discernible opulent-sweetness to the bouquet amongst an intriguing spiciness and metallic, flinty-graphite nuance. Crunchy, lively palate entry bursting with red cherry and yet plush and smooth, and immediately shows much more depth and texture than I have ever seen in an Beaujolais-Villages, indeed a viscous-velvety smoothness that would make many a pinot noir producer jealous. In all my years of tasting, I cannot recall a Beaujolais-Villages of such quality, so impressive in its intensity and gorgeously endowed with fruit. Whilst a superb drink now I would also highly recommend putting several cases in the cellar for a couple of years. Bright red cherry with some rich plumy notes, again exudes a spiciness but also hints of lavender and youthful minty-ness. 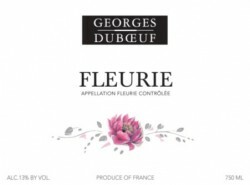 A lighter framework than the Flower Range with a gentle tannin grip and darker, red and black berry fruits on the palate. Quite refined and certainly elegant, perhaps not quite fully open yet. A little closed on the nose (would suggest due to air-freight of some samples bottles), slowly opening up to reveal ripe red cherry and red current, with a pronounced nuance of graphite-minerality. 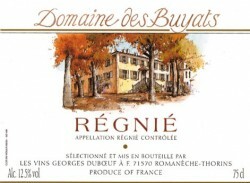 Showing the vintages excellent plush fruit sweetness and excellent texture with some fine tannin, mid palate grip with refreshing acidities and lingering minerality. 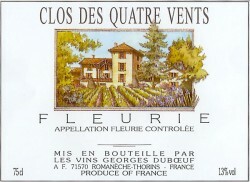 Overall a firmer and tighter wine that will bloom in a few years. 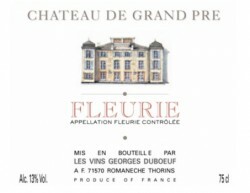 Sweet perfume of red cherry and raspberry with hints of candied fruits – sherbet-like, very floral with violets, rose petal with a youthful lavender and fresh acidity background. Noticeably more focus in the fruit and a certain tangy quality and very much black fruits – rather different than the nose suggests and one can also see more structure here with gentle tannins and very perky and persistent fresh acidity that carries the fruit flavours to a long farewell. 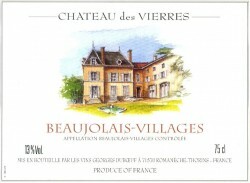 Serious Beaujolais that could do with a few years in bottle yet. Blackberry and black cherry exudes from the glass showing considerable concentration yet also an exuberant, vinous plush sweet aroma, but in the background a deep-seated metallic rust-like minerality. Juicy and plush palate with black-berry fruits – that is to begin with as it firms up considerably on the mid-palate with a good dose of black tea tannins (fine) turning quite spicy and tangy, with an earthy-savouriness and brooding quality. 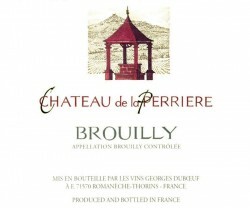 Quite assertive, firm Beaujolais that need at least 2 or 3 years in bottle yet. Very minerally, cold earth and flint, graphite and rusted steel amongst deep, concentrated black – berry fruits, quite a formidable melange of minerality and intense fruit. Quite a firm palate with a lot more tannin structure although no shortage of flush sweet/sour intense black fruits, invigorating acidity and a slightly drying tannins on the finish. Personally, I would leave this brooding monster for at least 5 years as it will certainly reward cellaring. 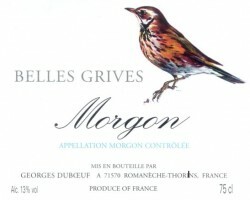 Lovely perfume of super-ripe black cherry and blood plum, deep, heady aromas infused with Indian spice-box – an intoxicating bouquet that has one anticipating an exotic palate – which it is, with a gorgeous, rich texture yet bright and juicy with red and black fruits, very rounded and overall complex with a degree of fine-tannin grip and earthy, black tea flavours balancing the plush, sweetness of the fruit. 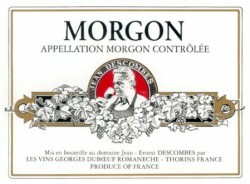 Brilliant drink now, but will offer more with a few years on it – one of my favourites in the line-up. A very rich and alluring bouquet of deep blackberry and cassis, also char-grill-charcoal nuances and roasted beetroot, with lots of mineral and an infusion of dried thyme and scents of Provence. Gorgeous palate, incredibly lush and caressing, layers of creamy textural sweet plumy, black cherry fruit perfectly balanced and cooled by fine black tea tannins and an underlying earthiness, hot black dark clay and graphite flintiness. A most impressive and full-blooded wine that has the senses calibrating with serious pinot noir – and whilst a real mouthful of enjoyable red now it will cellar for a decade, probably two actually! 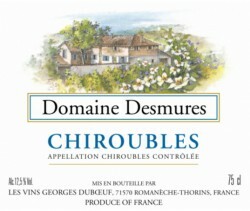 “The Mother of all Beaujolais” and my equal top wine of the tasting and French red wine of the year! Buy in multiple cases. 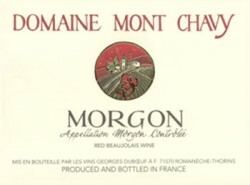 This wine suffered from two aspects; firstly I think it was quite closed from air-freight-lag and also coming after the Domaine du Mont Chavy is a tough act to follow. Seemingly much tighter and leaning towards red cherry and violets. Quite firm on the palate with tannins to the fore, but lurking underneath is some tangy intense raspberry fruit spurred along by invigorating acidity. As it breathed out it showed a little more silkiness in the palate suggest it will come together and flesh out with age, probably a good 5 years ahead of it. Deep, brooding bouquet of blackberry and dark plum, hints of cassis and liquorice with a dark earth, cold iron mineral background. Rich, juicy plum and blueberry, a powerful palate, discernibly zingy and spicy with real tension and great length, some firm, fine tannins adding to the structure and spicy farewell. 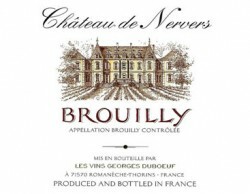 Serious wine with power and intensity, very focused, suggest at least 3 to 5 years bottle age will see it round out and become more textural. Like it! Rich, plush nose exuding rose petal and blackberry, black fruits compote, the sort of bouquet where one can only envisage an opulent texture, lurking behind are lots of iron-mineral, and a hint of dark chocolate. Absolutely gorgeous palate, silky-smooth, so round and plush it glides through the mouth coating it sweet syrup of baked blueberry and dark raspberries, yet brilliant acidity, lively and pure with some fine tannins kicking to remind you of the wines overall power and intensity. Already integrated and a wonderful drink but can imagine this will evolve over many years. A buy – multiple cases. Bright perfume, intense floral-violets scents and ripe raspberry with hints of lavender and Pennyroyal mint. Perky, refreshing palate with maraschino cherry, smooth and rounded, polished, although showing a youthful grip of tannin and a long, lively acidity finish suggesting more time in the bottle required. Certainly over-delivers in price/quality rapport.